Long time no see! 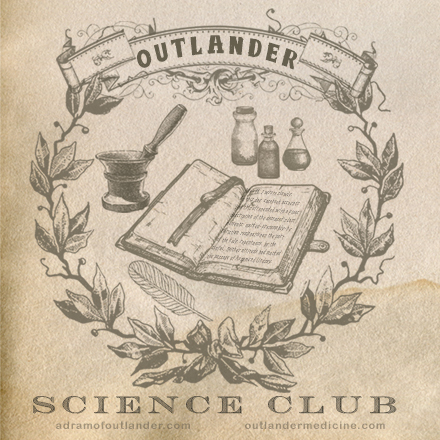 Well, about that…with finding myself as patient and mother to a patient and a few knee surgeries between us in the past few months, Outlander and its associated fun has taken a back seat. While we aren’t fully done with the knee sagas at my house, I’m glad to be finding mental energy and time to “play” again in this medicine of Outlander world! Many thanks to my dear friend A Dram of Outlander for again inviting me to join in on the fun of another #ADOO read-along, this time for Drums of Autumn! As the title of Chapter 6 would suggest, in this week’s read-along of Drums of Autumn, we do indeed meet a hernia, one belonging to the unabashedly immodest Mr Myers! “Well, no,” I said, biting my lip. “I really doubt it.” He moved very slowly, but had almost got the knot in his thong undone; people in the street were beginning to pause, staring. The wide hazel eyes got wider. “It is?” He seemed impressed, and not at all displeased by the news. From Drums of Autumn by Diana Gabaldon, chapter 6. The protrusion of an organ or other bodily structure through the wall that normally contains it. A hernia occurs when the contents of a space bulges through a weak spot in the wall that should normally hold it in, for example, loops of intestine bulging through a weakness in the abdominal wall. These may occur anywhere the wall is weakened, either by normal anatomy, or by prior injury to the wall, whether from trauma or previous surgery and look like a bulge under the skin. In this case, the unforgettable Mr John Quincy Myers is suffering from an inguinal hernia, in which some of the contents of the abdomen bulge though a weak spot in the abdominal wall in the inguinal region. Inguinal hernias are quite common, with a prevalence of 5-10% in the US. Worldwide, 20 million groin hernias are repaired each year! Risk factors that may increase the chance of developing an inguinal hernia include being male, older in age, Caucasian, having a chronic cough or chronic constipation (things which increase the pressure in the abdomen), having a family history of hernias, history of previous hernia or hernia repair, or premature birth. Aside from causing discomfort, with symptoms including groin pain with exertion (such as lifting or coughing), heaviness, and aching, hernias can develop significant complications. The loops of intestine within a hernia can sometimes become trapped within the hernia and no longer be able to be reduced, or pushed back into the abdominal cavity. This can result in a bowel obstruction. Additionally, when loops of bowel are trapped within the hernia and cannot be reduced, the blood supply to the bowel can be squeezed off, resulting in rapid tissue death. While the risk of these complications is low, these situations require urgent surgery. How are inguinal hernias treated? Generally, most are repaired electively, either via laparoscopic or open surgery, each method having particular indications, depending on the location of the hernia and the patient’s history. Inguinal hernia repair would of course be routine for Claire, but the question of course, is what to do about anesthesia (or the lack thereof in the 18th century)? Hmm, let’s stay tuned! In the meantime, Claire has suggested Mr Meyers try a truss, or brace, to help with his symptoms, and in fact, these are still used today. The truss is a supportive undergarment/belt that exerts pressure on the area of the hernia to prevent it from bulging out. While elective surgical repair is generally the preferred treatment for hernias, some find a truss to help reduce sytpoms while they await surgery. What about that mention of the morbid sore throat? Morbid indeed! The term “morbid sore throat” was quite formidable and refers to what we now know to be diphtheria. Read all about it in this post (Old Hector isn’t the first Outlander character we’ve learned to die of it!)! Hope to see you at this Wednesday’s #ADoO twitter chat where @dramofoutlander and friends delve into all things Outlander, morbid, herniated, and all!